I'm all for commemorative souvenirs but these candles are just plain creepy! 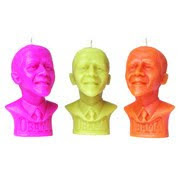 Candle maker Bougies la Francaise is peddling via Selfridges in London, President Obama in wax. Do you really want to burn an ethnic man? Not a good marketing scheme there is it. But they'll sell in Alabama. No kidding. It's so wrong on many levels. I can't believe that someone created this trash. They are kinda creepy aren't they? They are. I think it looks more like Nelson Mandela.